I was getting increasingly anxious to finally bite the bullet and pursue repair and/or replacement of my defective MacBook Pro. I have held off for a while hoping that Apple would get its story straight and hopefully have a comprehensive, time and cost effective method for dealing with these complaints. After the initial experience of calling and scheduling a product return, I will say that I’m pretty pessimistic that all of my problems will be fixed, but I’m hoping for the best. I was inspired to finally call when Tom Harrington told me about his experience reporting similar (though not quite as extensive) problems. Something about the courage of numbers or something. After I called, I also noticed a good write-up by Jason O’Grady on the subject of his similar experience. In my opinion, the more people who speak openly about this problem and the results of pursuing a solution, the better. Here’s how my process went. I called up AppleCare and got a very friendly, sympathetic representative, who dutifully wrote down every last smidgen of detail I recited to her (for the record, I only complained about display buzz, display squeal, cpu whine, mooing, and heat). I asked her up-front if it made sense, given that I was going to reveal a laundry list of MBP issues, that I be transferred to a “product specialist.” She let me know that if that were to happen she would have to provide them with a written list of the complaints anyway, so I went through that process with her. It took about 15 minutes and when we were finished I was put on hold while she talked to the product specialist. I never actually got to talk to the specialist, but apparently my representative sort of relayed the facts of my problem to the specialist, and it was the specialist’s job to bat down as many of them as possible while essentially only admitting to the likelihood that the screen buzzing was the known screen inverter problem. The verdict? “Send in the MacBook Pro for the display buzzing and hopefully everything else will magically get fixed as a side-effect.” Uh, yeah right. So I explained again as cordially as possible that I understand the process a little bit, and if I’m just going to end up sending it straight back in to Apple for further repairs, it might save us all a lot of time and money if she can emphasize my desire to get the other issues addressed. In the end my tactic didn’t really work. After almost an hour total spent on the phone, I was given a dispatch number which would be used to track the repair process. Oh well. I’m really pessimistic that anything but the screen buzzing will be fixed on this round, but at least that will be a start, and marks the beginning of my due diligence in letting Apple repair the defects of this computer. An hour or two after the telephone call, I got an email confirmation, summarizing the gist of my complaint as “Customer Sensory Issues.” This was the same assessment Tom had received, and I think the fact that more than one of us has gotten this assessment betrays Apple’s failure to own up here. Maybe chalk this one up as another case of “unfortunate use of language,” but the problems here are not “customer sensory issues.” True, there would be no problem if I didn’t have senses, but if that were true I would also have no credit card. And $2000+ from that credit card would also not be sitting in Apple’s bank account right now. These are “MacBook Pro Noise Issues” – not customer sensory issues! To Apple’s credit, they pay for all the shipping costs to and from the repair center, but the amount of time I had to dedicate to being at home just to make this happen I think embodies the reasons people hesitate to embark on the process. First, I had to wait for the delivery of the empty box. It was shipped “overnight” but I found out that it really means “within 2 business days.” I was so eager to be here for the delivery of the empty box, that I practically didn’t leave the house for the whole next day after calling AppleCare. Missing the box would mean an extra day of waiting! The first day passed and no box. Shucks! Fortunately, on the second day the doorbell rang at around 11:30AM and I ran down to make sure I took possession. Since I’m up on the third floor, it’s not unheard of for delivery people to give up and rush off before I’m even able to make it down there (we don’t have a buzzer or intercom). I raced down the stairs, my heart pounding, and thrust open the door. The box was sitting alone on the porch. A yellow DHL truck revved off down the street. Ah, quaint, trusting Somerville. I guess I didn’t have to be here at all. Hope they don’t leave it on the porch when it’s full! I took the box upstairs, opened it up, gave my MacBook Pro a final kiss goodbye, and packaged it according to instructions. I was especially impressed with this little tablet of individual packaging tape slices. Neat! My future best friend lay waiting in the box, now all I have to do is call DHL back and get them to pick it up! I was hoping that maybe because DHL had just been here moments before, they might still be in the neighborhood to come back and pick it up. I guess it doesn’t work that way. I called at around 12:30AM and got an estimated pickup time of “by 6:00PM.” OK. that’s kind of a huge chunk of my day, but hopefully they’ll come early. I sat around (working, but sitting around) all day waiting for that door bell so I could once again make the sprint down the stairs, this time with the precious cargo in tow. Hours passed and no doorbell. I occasionally feared that somehow I’d missed the doorbell, so I went downstairs to check for any sign of a stealth visit. No signs. At 6:00PM – pretty much on the dot – I called the DHL number to see what was up. I didn’t particularly have anywhere to be, but I had postponed things like taking a shower all day so I could be present for this process. I’d just as soon out of “being DHL’s lap dog” mode, and back into my normal daily routine. I hadn’t misunderstood. But I was trying to be nice. I didn’t want any chance of this pickup guy getting angry with me and purposely mishandling precious. Anyway, it was just another hour so I figured I’d wait it out and finally be done with it. When 7:00 rolled around, I starting getting irritated again. What the heck. This time I waited until 7:15, pacing around the living room and peering up and down the street for signs of the yellow truck. I called DHL again – I just wanted to make sure the driver didn’t check out for the day without picking up my package. MMmmmmmmkay. I guess a six hour window isn’t enough time to work with when picking up packages. I wouldn’t mind so much if they would just narrow it down a little or give me updates throughout the day. Like “there’s no chance in hell we’ll get there until after 5:00 so feel free to go out for lunch.” Even the DMV does a better job than this. At this point I’m pissed but still being polite on the phone. What if I had dinner plans or something? DHL is not winning my affection. Finally at 7:45 (only 15 minutes late!) the driver rings the bell. I sprint down the stairs faster than ever, making as much noise as possible on the way. This is how I let the delivery guys know that I am not only home, but I’m completely insane. When I get to the door and open it, I see the driver wielding a portable bar-code reader. I rotate the box so that the scannable label faces him. “I see you’ve done this before!” he says cheerfully. I continue making smalltalk, offer my sympathies to the driver as he complains that he still has several more pickups to make. He complains that there are too many one-way streets around here and he keeps getting lost. I feel sorry for him, but I also feel sorry for the several people after me on his list, who are also dancing around looking for yellow trucks to appear on the horizon. As I said earlier, the outlook is not great for my getting a completely repaired MacBook Pro. I got good lip service about the problems, but they were more eager to offer workarounds like “maybe you can make sure the micorophone is far away from the computer” when I offered reasonable circumstances in which the noises make the computer a less than Pro offering. Since the well-trained telephone staff seemed eager to dismiss all but the completely undeniable defects, I decided I better try to appeal to the techies themselves. So prior to sending off the MacBook, I made a few notable preparations. First and foremost, I backed up every single bit of data that was in any way important to me. They can incinerate precious if they want to, as long as they send me a new one without noise. I am psychologically separated from that machine in particular. I never even installed the extra 1GB RAM I ordered, because I wanted to be sure it went into a machine that would be mine for a long time. If these noise issues are not fixed, I will be demanding a refund or a replacement. In the worst case scenario, I guess I’ll be stuck with 1GB of RAM and no laptop to use it in. After archiving my own stuff (I left an encrypted copy of my home directory on the disk, for my convenience if I do get the same one back), I went to setting up the “optimum techie user account.” When you’re on the phone with Apple, they’ll ask for your login and password. Instead of giving it to them, just ensure them that you’ve set the machine up to auto-login when it boots. I added an account “apple” with password “apple” and hint “The password is ‘apple’.” I set this account up as the auto-login account. There. A fresh clean space for the techie to enjoy my laptop’s flaws in. After setting up the techie account, it occurred to me that I might improve my chances of success if I improved the odds of the techie observing the heinousness of the problem. In particular, the CPU whine seems to be the most disputed of flaws by Apple. Reports across the web paraphrase Apple as basically dismissing the noise as “within Apple spec.” My earliest hack at quieting the noise was a little program called “QuietMBP,” which utilized the CPU at varying levels such that the noise was eliminated or extremely diminished. 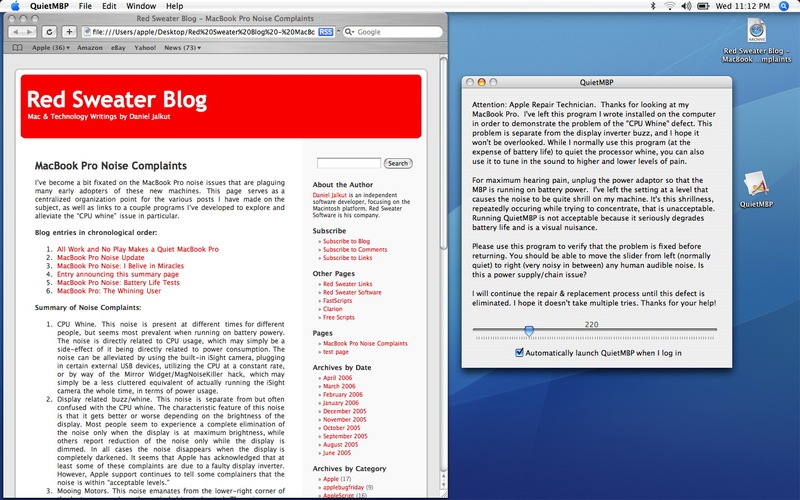 Now, a side-effect of QuietMBP is that you can also adjust the slider “the wrong way” and hear the noise. But when the slider is midway, it turns out there is a sweet spot of pain, where the noise is even worse than it is when the machine is completely idle. This demonstrates the “worst possible scenario.” It’s not exactly realistic that the machine will always be in this state, but then again it’s not exactly unrealistic. It’s just a program using the CPU. There’s no reason to think that Photoshop or some other program might not use the CPU with such a pattern as to maximize the noies. I decided to set up QuietMBP in “noisy” mode, and configure it to start automatically with the “apple” account logs in. In place of the usual text in the QuietMBP dialog, I added a direct plea to the techie. I explained what the program was there for and suggested that until the slider can be moved from one extreme to the other with no audible noise, the machine was still defective. I also made it clear that I would be returning any machine that didn’t pass this obvious test of “fixedness.” As bitchy as this may sound in the blog, I was a bit more tactful in the actual text. If everything goes well, the techie will be staring at the above screen while also noticing a hideous high pitched chatter coming from the left side of the machine. If the techie cares at all, he or she can also pursue the questions raised in my blog, after connecting to the internet or on another machine. It may not make the slightest bit of difference, but I figure there’s at least a small chance that the techie will be touched by this problem, and become independently dedicated to making my MBP well. Please, Apple Techie! Fix my MacBook Pro! Heck, fix them all! This entry was posted to Apple, General, Intel, MacBook Pro, Technology. Both comments and pings are currently closed. Thanks for reading! Good luck. I really hope this goes well (for you and the rest of us). It was a really great idea having your app autostart with that text in the dialog. That’s a great idea with the auto login and startup of things – I hope it works for you first time! I must say kudos to you and all your efforts in trying to resolve the various issues related with the MacBook Pro. Your efforts goes very much appreciated and if Apple does address the issue(s), I believe it would be more than reasonable to say that you were a big part of the solution. Best of luck to you and I look forward to your report on the return of your-hopefully-fixed MacBook Pro. Geez, what a cliffhanger. Here’s to hoping that they don’t just crack that case and swap inverters without even booting it up (unlikely). I’m curious to know if your efforts have any effect in urging the techies to go the extra mile. The techies at Apple are like their customer service reps: the quality varies widely. Best of luck. Good luck Daniel. If this does indeed work and everything comes back fixed (fingers crossed), would you perhaps release the version of QuietMBP with the altered text? Maybe we can ALL start following these steps. Quite frankly, there’s a lot of people out there who would have thrown their MBPs against the wall if it weren’t for QuietMBP and MagicNoiseKiller. Thank you for your efforts. Well I don’t believe this.. tonight as I was taking my MBP out from my hidden storage spot (note: in the dark), I did the unthinkable, the MBP slipped out of my foofbag, out of my hands and fell to the floor. Oh no you say? – No scratches or dints whatsoever. Checked thoroughly. – The “sweeping brush” sound when turning the MBP on, has gone. – The warped lid seems to have “unwarped”. – The CPU whine has pretty much gone. I can close QuietMBP and I don’t even hear a thing unless I go close to the speaker. The normal fan noises are louder than the whine. If I really try hard to concentrate on the noises, I can hear them, but most of the time my keyboard typing or fan noises are loud enough to make it non-existent – GREAT! – As of now, I’ve been using the notebook on my lap in bed for the past 30 minutes or so. 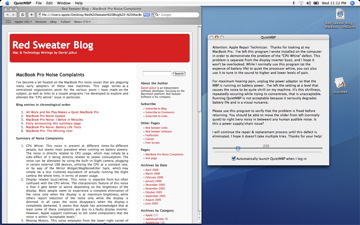 I’m not using the notebook heavily (only Quicksilver and Firefox 1.5.0.2 are open), but the heat is VERY ACCEPTABLE. Above the F keys it’s warm. Next to the MagSafe it’s cool. – Everything seems to be functioning perfectly. No damage from the fall. No damage to the screen, dead pixels etc. While I’m not suggesting everyone goes and drops their MBP on the floor (hah), I can’t believe almost everything is sorted by a bit of a jolt to the internals. Could it really be that simple? – MagSafe / top of right speaker area = Could almost classify it as cold. – ESC to F9 = Very mild. – F10 – F12 = Tad warmer than ESC to F9, wouldn’t even call it warm. – Power button / top of right speaker = Same as MagSafe area, that is, COLD. – Left of trackpad = Cold. – Right of trackpad = Cooler than ESC to F9.. pretty much cold. – Bottom of MBP = Warm. The hottest part of the notebook, and only in the center. – My lap: Loving it. EXTREMELY COMFORTABLE! This is unbelievable. I think I don’t even need to take this thing in for repairs. In fact it’ll be hard for me to prove the CPU whine. Update 2: The 2 100% CPU usage processes are still going, fans are still going. Temperatures have been the same for the past 10 minutes now. Update 3: After around 11 minutes of the loops running, quit Terminal. Fans have turned off. I was expecting to hear the whine (QuietMBP closed). I can’t hear anything. It’s 2.23AM, and awfully silent in the house. Perhaps the people with silent MacBook Pro’s have had their notebooks cop a bit of a rough journey from warehouse to home? Daniel, what a great post! I wish you the best in getting your Powerbook repaired. Just be oh-so-thankful that you’re not having to go through this in Europe. I live in Spain, and purchased a G4 Powerbook (from Apple.com’s Spain store), whose display died three days after it arrived. I called Apple, who told me to drive 1.5 hours to the nearest Apple dealer, and send it off for at least three weeks. I then said I’d like to buy AppleCare, so that someone will pick the thing up at my home. “Sure” the man said, and proceeded to take my AppleCare order. “There you go, AppleCare now purchased. So, please drive 1.5 hours to the nearest…”. Long story short– about a month later, I got my Powerbook back. It looked like it’d been attacked with a screwdriver. I’m going to post some pics soon on my blog. They replaced the display and logic board, but somehow in the process the display latch magnet dropped out. That little bit is what tells the machine the screen has been closed. And, in addition, the screen now periodically dims here and there. So, I guess it’ll go back. You know, you spend $3,000 on a Powerbook, you want something shiny and new, that works. You don’t want a frankenstein of a machine that’s been disassembed several times. Know what I mean? I have just went through a similar process with Apple support. I basically went to the genius bar and explained the whining noise problem to the techie. He took it inside for a while and cam out acknowledging the problem, much to my suprise. He then started looking around in their, seems to be, internal support system and he told me that it seems that there is indeed a problem and it is probably in the fans. I patiently explained to him that it does not look like it, then I went through the process of explaining the idle CPU common problem, etc. He said not to worry, they will take care of it and asked me to leave it for repaire, which I, in my despare, did. Around 7 days later they called me to tell me that my mac is ready for delivery. The guy on the phone told me that they have replaced all the fans in the laptop. So I asked him if the noise if totally gone, he said it should be. With some doubt I explained to him the entire CPU idle issue. Much to my surprise, he said “oh I know what you are talking about, I have a macpro myself”. At last! an apple insider who knows what I’m talking about! so I said whats the solution? he said apple has released a new firmware update to fix the problem and he is going to do it right now before delivery. I was thinking to myself .. hmmm … so they did not really fix any problems in the first time, they just wasted 7 days (and hence expiring my 14 days return period) to replace some fans that seemed to be working fine! In any case, I thanked him and I convinved myself that Apple is great and they could have really fixed the problem. When I got the laptop, not too much to my surprise, the noise wasnt gone! it was the same if not worse! I have also noticed another change, the noise gets stronger when I plug the power (it was not the case before the repaire). Talk about a whining, noisy machine that was already cut open before! I am planning on going back to them and have a talk. If they cannot fix it, I will simply return it. Meanwhile, I am using QuietMBP to maintain a sane state of mind. What I find odd is that the clock was reset on my MBP when it came back from “Repair” since they replaced the logic board. It also prompted about that when we logged in at the Genius bar. That makes me think that the Apple service center may not even log in to check these things after they switch out something as extreme as the logic board. Thats not good. Anyway, mine is set for a round trip to apple as soon as I hear someone has some luck with theirs coming back. Also, DHL left my MBP sitting on the doorstep all alone. Luckily I was some and heard the doorbell but when I got there the driver was long gone. Wow, Matt. That is truly amazing. Thanks for sharing that, and I’m sorry you had to be the victim of such unfortunate service. I think Matt has inadvertently broken one of his CPU cores. Switching off one of the CPUs with CHUD tools is well known to completely abolish the noise. SO the fall has probably broken one his cores; and hence no noise. Don’t you mean “Raf”? Sorry, I was a little confused for a moment. Also, I just purchased a Macbook Pro on the 19th. Do any of you suppose that this one will not have any problems? I’ve read about certain serial numbers may not have this noise issue. I guess I will find out if no one knows anything. I have a macbook pro 15″ 2ghz/Intel Core Dua with 1GB ram – Serieal W81 etc. – got it in mid may – it’s now mid-June and noisierthan semi’s using jake brakes coming down a mountain pass. The buzzing pisses me off. I waited for this computer after my firewire Pizmo died like an expectant father. Now I’m a very disappointed father listening to my disabled child – the grinding sound on the left side. I’m pissed at Mac – they should take care of their products and know their problems in advance. It sounds like little airplanes taking off. Thanks for your site – it gave me the dose of reality (and depression) I needed.